On November 27, 2012 – I launched an on-line survey targeting graduates at the media arts schools in this report. Below are my findings. Most came in through messages sent (or forwarded) and a link to the survey in Facebook. I used my existing contacts there – 183 of them – 138 responded – 31 more came in through forwarded links (their friends/grads) – and the others (roughly 160) responded to the link provided in my WordPress MAE blog (at the time) – all between November 27 and December 27/12. I spent days sifting through the data – cross referencing in Google and researching disclosures. There have been 516 surveys (completed responses) in total. It should also be noted that just over 80% of all participants graduated from Private Career Colleges and that there were less than 20% coming in from the public sector and all graduating between 1977 and 2017. What’s most interesting and is the most surprising to me, is that 1/3 chose to with-hold their identity/names and that those “claiming” (overall) to be employed in the media arts business (full-time) were considerably higher than expected (see reported stats below). Even though I specified that “honest/truthful responses” were of critical importance – many responses were noticeably inaccurate/manipulated. Deciphering the data was the biggest challenge, taking the most time. In my observation, there is a lot of “wishful thinking” out there (not necessarily a bad thing but wreaking havoc on the task of data gathering). Many graduates paid a lot of money for an education and feel the need to justify that – when asked. For example, I had one participant tell me that he is a ‘freelance multi-media developer’ now living in BC but when I went to his Facebook, his occupation indicated that he is a security guard at a yacht club – stuff like that. This was quite common and created a sizable grey area that can’t be measured. Fortunately, about 70% of those surveyed were forthright in their disclosures, and I am still thankful to all those who participated, regardless. It was however, my original intention to gather accurate results across the board and thus, all I/we have here – is simply a better idea of what’s going on. There were originally about 60 – 70 that came in over the first 30 days, where the information didn’t add up (make sense). For example – how many can earn a living wage as a freelance “location sound engineer” living in Wallaceburg Ontario, or giving private music lessons to kids in Milton or as an “electronic communications coordinator” at a church in Guelph, artist manager in Barrie, wedding videographer in Markham, DJ-ing in Oakville – or playing in a band in London – or perhaps more importantly, does one really need a $20-30K media arts education to do these jobs? I’m sure the schools are elated that there are so many “successful” grads out there and can report them as such and this all makes for more optimistic KPI’s (Key Performance Indicators). What I’m saying is that the numbers (success stories) are inaccurate. Conducting this survey was a lot more work than I had intended. One school forwarded my survey link to all their “industry employed” grads (in an obvious email list – indicating a 100% success rate – yes many in the fringes but still indicating successful integration) and I had to disqualify (purge) all 48 of them – which was difficult but necessary (all coming in over a 12 hour period) as the 19 surveys coming in separately from that camp (over the 30 days), told a very different story. Still, on top of these challenges, I had numerous (abundant) “freelance” audio-techs/engineers and even “producers” living in and around the GTA (ie. Toronto, Mississauga, Brampton, Saint Catherines, London etc.) having graduated in the past 2 – 6 years. Some still living at home with their parents (or receiving financial support or with a wife who works full-time) some having (so-called) studios (having day jobs or no real jobs) and yet, almost all (90%+) “claiming” to be employed full time in the media/music arts business, having given themselves meaningful job titles and entitlements (some, even with dedicated websites.) Credits/photos with unknown bands and pictures sitting at big consoles (often a studio at the school they attended.) I couldn’t take most of them seriously. Still – stats below include all these, claiming to be employed full time in the media arts business (raw data). Several participants graduated from their programs and became successful media/music business entrepreneurs right away. It doesn’t work like that. I came to the conclusion, early on – that many graduates surveyed, like to “think” they’re doing something far more important than they really are. On an upside, there was/is a humble percentage legitimately working in broadcast (radio/television) some working at established production facilities in a support capacity – A/V technicians (corporate events) – numerous others in peripheral and yet pertinent occupations (ie. live sound/pro-audio/marketing etc.). Some employed in an administrative capacity and less than 1% actively employed in the music business (excluding music retail ie. Steves, Long & McQuade/HMV etc. ), which is the biggest draw for most enrolling in most of these schools – the alluring images pointing to fame, fortune and glory (in all the marketing bling). I however did find one, who graduated from Trebas Institute in 1997 who is now actually successfully operating a small recording studio/label in Minneapolis, Minnesota and records independent bands (coming in from all over the state). It’s what over 80+% of those going to Trebas at the time (thousands of students) wanted to do then – and I found one doing it! He’s a one-man show and he is successful (makes his living doing that). I think it’s important to report this and wish there were more like him. That being said, I’m disappointed. I was hoping for more accurate incoming data. There was quite a bit of reading between the lines that had to be done here – and thus I am sad to report that the final results of this survey (below) are inconclusive – at best. What I thought would be a simple task became extremely complicated/time consuming and yet I was determined to gather accurate information. I remember being curious, about 10 years ago, going through my Facebook friends list (144 at the time had attended or graduated from various schools where I taught). Only 13 of them were employed in the media/music business and the others were in everything from retail sales (music/electronic stores), servers/cooks in restaurants or Starbucks/Second Cup – to plumbers, construction laborers (to any number of other things). I was guessing then, that the integration rate was around 10% – based on that (crude analysis). Since doing this survey, I have reason to believe it’s double that. 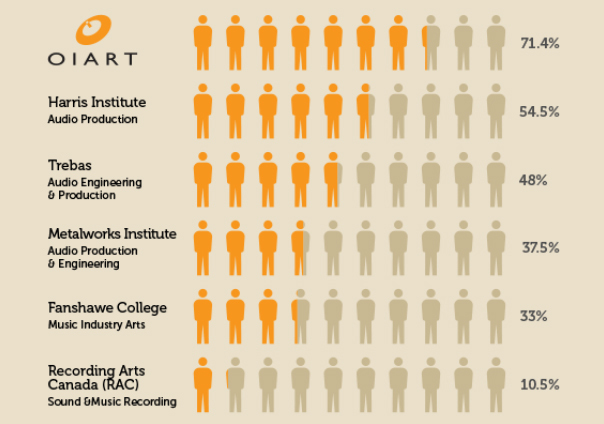 My personal overall interpretive conclusion (after carefully analyzing all the variables – realistically) is that on average – approximately 1 in 5 graduates (20%) from media arts schools – are in fact, legitimately or meaningfully employed in the media arts (or a media arts related) business – and that 4 in 5 (80%) operate/survive in unrelated vocations (primary income from other sources) and will likely never be employed in media/music arts. I also observed integration rates being higher (20% +) at schools like Ryerson University, Seneca/Sheridan Colleges, Ontario Institute of Audio Recording Technology (OIART), and Harris Institute – and lower (10-20%) at schools like Recording Arts Canada (RAC), Toronto Film School, Metalworks and Trebas Institutes. The lowest was at Fanshawe College – Music Industry Arts – London Ontario. I had 23 surveys come in from that camp, and only 2 were meaningfully employed (in Toronto) in a media arts related job that they were trained for at school. For those who have successfully integrated, any of them will tell you – there is very little glamour in the cards. It’s tough work. Long hours, temperamental employers, stress – deadlines, monthly quotas – irritated customers and low pay for the amount of time invested (in most cases). The term “paying your dues” still rings true – sacrifices made – and unlike the images we see on school’s websites, there’s not a whole lot of bling (fame, fortune and glory) going on in the real world of media arts – and yet (of course) – anything IS possible – with focus, self discipline; ambition in motion and in time. A big problem with young people entering the field; is thinking that it’s going to be a lot easier than it is – and that signing up is a ticket in. As an added note of interest – beyond my findings above, I do not consider those working at music stores/electronic retail, musicians/DJs or those employed in education (ie. music lessons/instructors or teaching assistants even at media arts schools) as being legitimately employed in the media arts business/profession, even though most (in these categories) answered YES to question 3 below and that official KPI stats are inclusive of such destinations. Of course one could easily say (after spending $20-30K on a media arts education), that getting a job at Best Buy in their ‘home audio’ department, usher or concession worker at a movie theatre or working oneself up to a manager at a music store; freelancing at their home studio or working 12 hours a day doing craft services (catering) or delivery/cartage for a film/TV production company is “meaningful” employment. I do not. What I learned from doing the survey/poll is that it’s the graduate’s continued wishful thinking that propels the documented KPI results and it is the inclusion of all these peripheral occupations that more than double the reported employment rates and fundamentally have little/if anything to do with their education; creating the illusion that they are all industry success stories (living the dream). This survey also includes the 76/516 incoming answering YES to Q3 saying/reporting that they are freelance (self employed) engineer/producers (or successful music/entertainment/media industry entrepreneurs – raw survey data). The most accurate KPI (Key Performance Indicators) are in the student default rates published below (link) for 2013. Those schools indicating a 20%+ loan default are schools whose graduates found it difficult to pay back their OSAP loans – probably due to their inability to secure meaningful employment (in or out of the media field). Q5 – Did your Media Arts Education – certificate/diploma/degree help you find employment? Q6 – What is your current occupation (job title) and where do you work (company/organization)?